My project is a remote administration tool where i have a same Form in client and server. 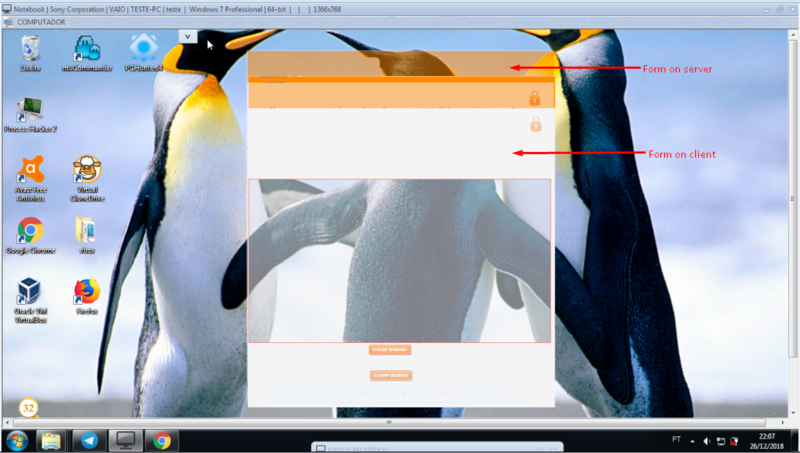 The form on server side is a "mirror" that is useful to i draw two aligned holes in client side, this Form is centralized according client screen resolution. These holes in client side are made: one in a "locker form" in fullscreen (that have a screenshot of desktop in grayscale) and other made on Form that is the same that have on server (like said above, the "mirror"), the owner of this Form is the "locker form". Then my trouble here not is to align these holes (in client and server) and yes align the Forms ("mirror" Form of server side and your clone in client side), like you can see on image above, the "mirror" Form (on server side) is showed more to top of screen while your clone (on client side) is showed more below when both are compared. Like you also saw on image above, exists a ScrollBox component on server, then in my tests if i adjust scrolling (manually) to down this can align both Forms ("mirror" Form on server and your clone on client). But will be that exists something that can align automatically using Delphi code? Thank you by any suggestion/solution. Last edited by Luiz Eduardo; 12-29-2018 at 11:44 PM.